If you're working out in the yard often, you'll know how frustrating it is to have your waste bags tear open on you. You have to pack everything up in a new bag, wasting valuable time and money. 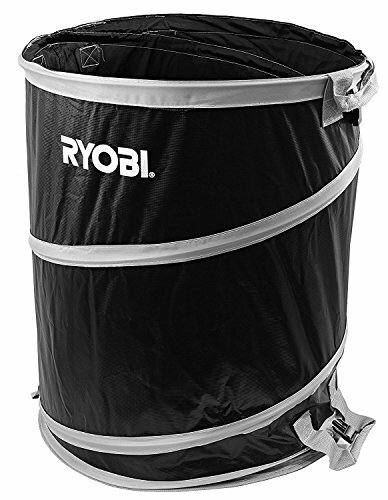 Ryobi has a strong bag that puts all inferior paper products to shame. This collapsible bag is made up heavy duty fabric that can resist tearing from overstuffing, or jabbing from sharp sticks or thorns. It's also mildew resistant. Leave it outside full of waste overnight or in your damp garage. It's unlikely to accumulate that unpleasant scent. Weighing in at under four pounds, you won't have to worry about fatigue, either. Keep this full of your most common lawn refuse and dump it easily. It has four straps that allow you to carry and dump this with ease. The only thing this doesn't do is throw the garbage out for you! With Ryobi, you know you'll be getting the most pleasant waste collection experience possible.